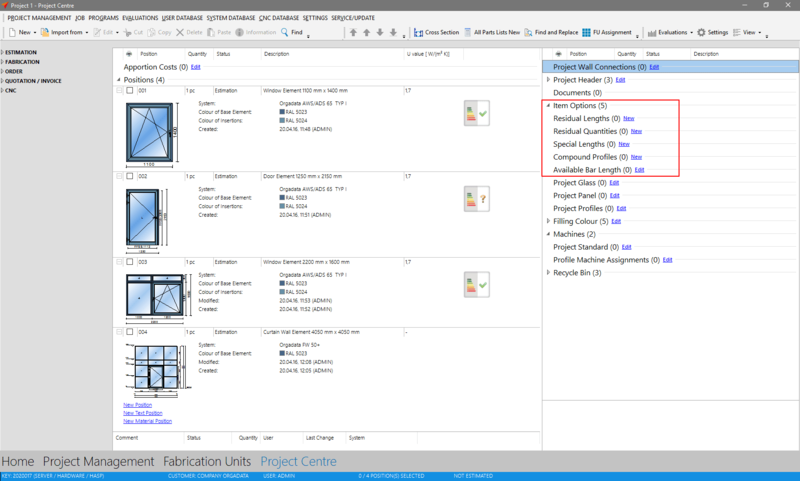 In the project center’s right column you find „Item Options“. Hereunder you can enter residual lengths, residual quantity, special lengths, compound profiles, and bar lengths. The function „Residual Lengths“ enables you to handle residual lengths from profiles in your project. Note: Only profiles used in the current project are imported as residual lengths. Select „Item Options“ > „Residual Lengths“ > „New“ in the project center. When using residual lengths in the cut optimisation and the cutting list, you will find the following information on the print-out: „Note: Use Residual length here <Name>“. The function „Residual Quantities“ enables you to handle residual quantities of items in your project. Select „Item Options“ > „Residual Quantities“ > „New“ in the project center. The entered amount under „Residual Quantities“ will be deducted from the amount of the item to order. Reduce the wastage by ordering object specific profile lengths. With the special lengths function you are able to determine the optimal special length for each profile. 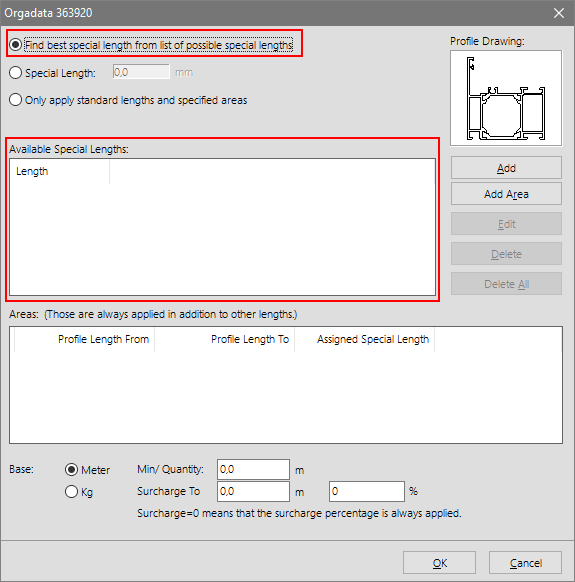 Click „Item Options“ > „Special Lengths“ in the project center. Activate the function“Find best special length from list of possible special lengths“ and enter the values under „Possible Special Lengths“. The values in this field are taken into account, if the optimal length in the cut optimisation is unknown, yet the supplier offers different special lengths. Please note, that in this case the programme always refers to one of these lengths for cut optimisation and order, and does not mix the lengths. In case a preset special length is to be used, activate the option „Fixed Special Length“ and enter the according value. Besides using standard bar length from the item data, with this function you are able to define areas. These will be mixed in the cut optimisation and the order. 3001 mm to 4000 mm for 4000 mm Special Lengths etc. If the necessary length of an item falls below the minimum quantity, the programme automatically falls back to the standard delivery lengths. As soon as the minimum quantity is exceeded, the special length applies. Furthermore you have the opportunity to enter a minimum quantity surcharge. You receive the special lengths starting at 500 kg per profile section. Between 500 kg and 1000 kg you pay a 20% surcharge. Starting at 1000 kg the special length remains cost-neutral. The programme adds the minimum quantity surcharge to the general wastage in percent. In this case it is mandatory for you to activate „Calculate Optimised Wastage“ in the estimation. Otherwise the minimum quantity surcharge is not taken into account. Under item options you have the opportunity to define compound profiles. 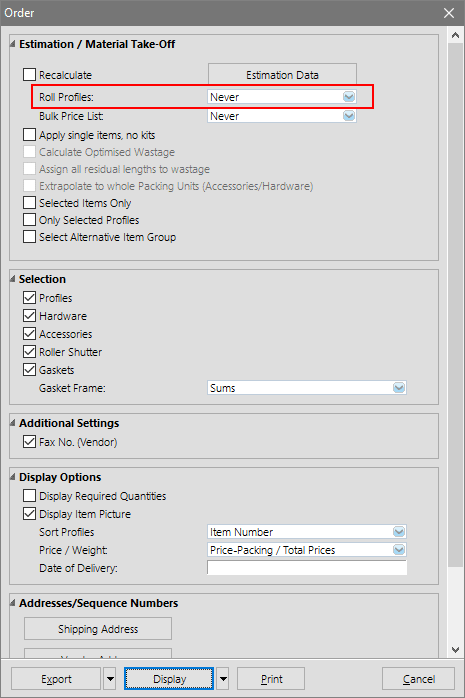 Select „Item Options“ > „Compound Profiles“ in the project center. This function is useful for you in case you wish to roll up the profiles yourself with an isomat and do not wish to order them rolled by the customer. With this order the inner and outer half scales, as well as the thermal breaks, are delivered separately – not as a complete profile. In order for this setting to be taken into account you need to activate „Roll Profiles“ > „Always“ when generating the print-out. For editing bar length you will find an own function in the project center. This function enables you to determine which bar lengths shall be used for cut optimisation and profile order in the current project. Click „Item Options“ > „Bar Lengths“. Depending on the supplier, the profile bars may be available in different lengths. In the upper field you determine which alternative bar lengths are to be used for the relevant profile numbers. In case a profile number’s checkbox is deactivated, only the item number entered in this position is optimised. In case of an activated checkbox, the beam causing the least wastage is determined. In the lower area you will find the input for „Profile Groups“. Here you determine if the programme is supposed to automatically search for the optimal bar length within a profile group. Here you can also select the individual bar lengths of a profile group. 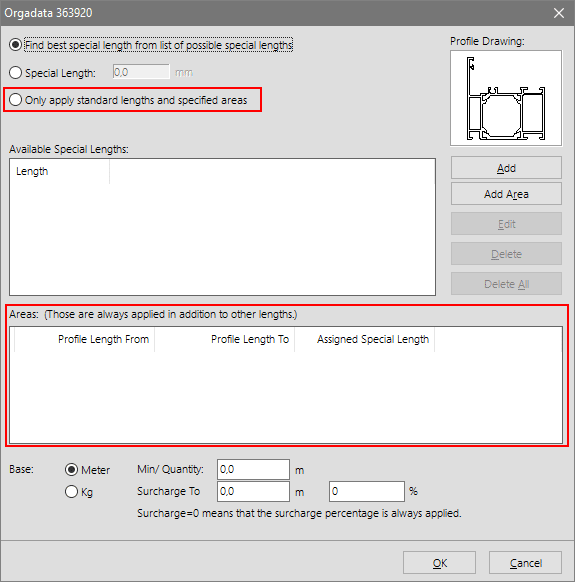 By using the option „Use different Bar Lengths if necessary“ under „Cut Optimisation“ the minimum necessary quantity out of both profile lengths gets calculated. 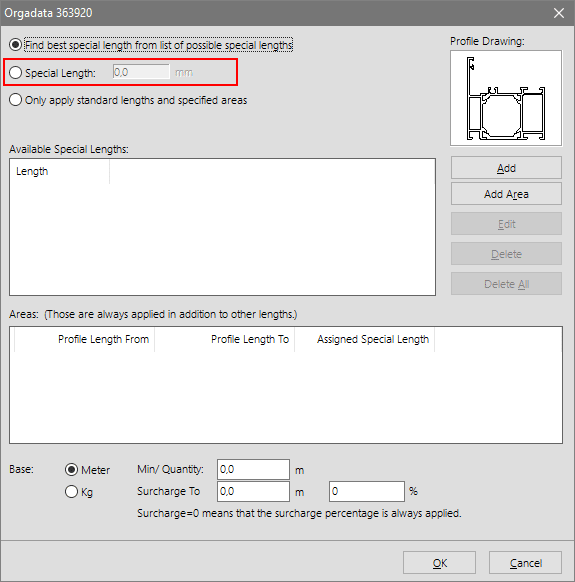 By deactivating a profile length under „Length 1“ or „Length 2“ the required bar lengths is always calculated, regardless of the entered profile number. 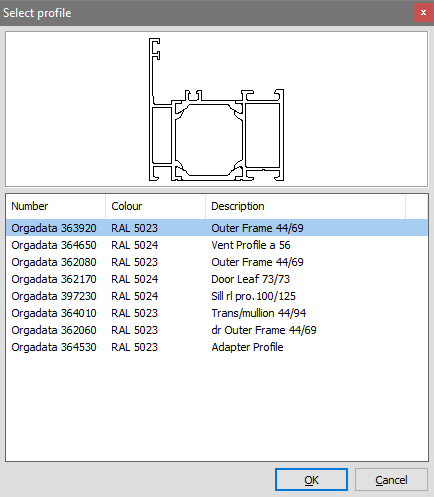 The assembly list always shows the profile number used in the position input.